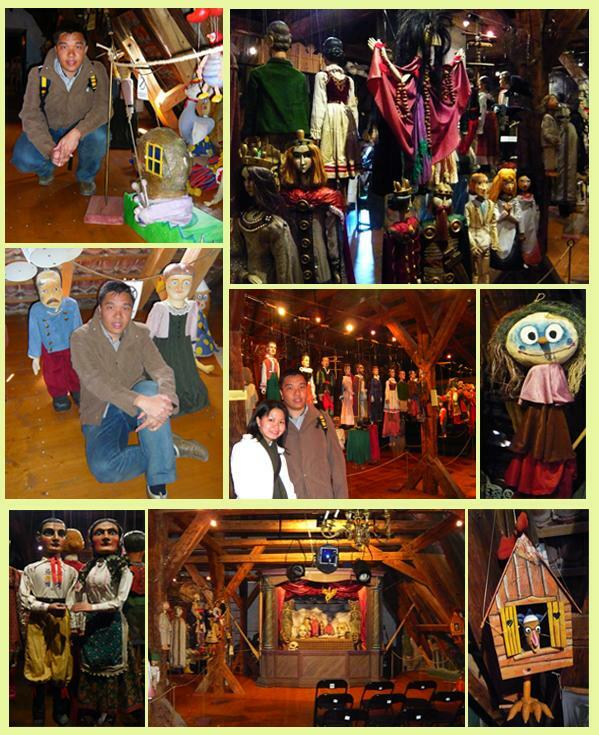 The Czech Republic has a long history of puppetry and puppet-making (also known as marionettes). Back in the medieval ages, Czech puppets were used to tell stories and entertain crowds around Central Europe (a form of entertainment for the masses before we had TV and internet). Towards the beginning of the 19th century, Czech puppetry had developed into a revered art form e.g. care and detail were put into the faces of Czech puppets created during the Baroque period, bringing Czech puppetry to new levels of sophistication. 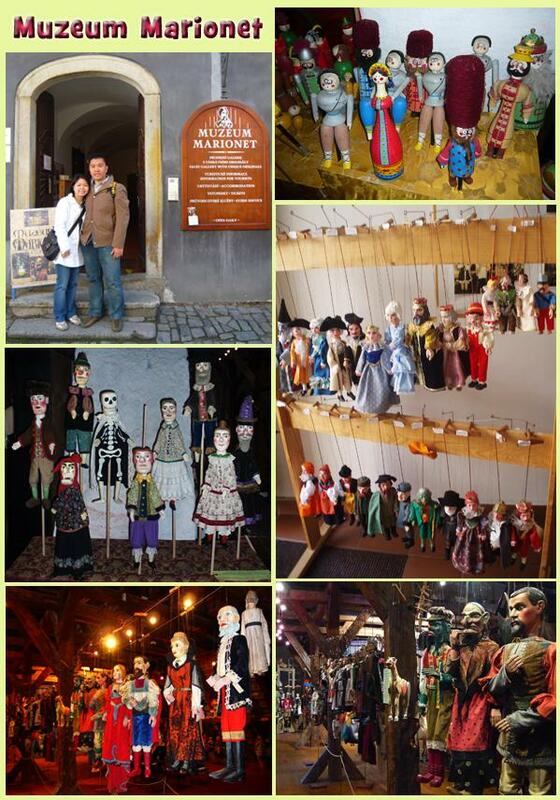 At the Muzeum Marionet (Puppet Museum) in Cesky Krumlov, there’s an impressive display of historic Czech puppets, both string and rod, mostly dating from the late nineteenth and the early twentieth centuries. 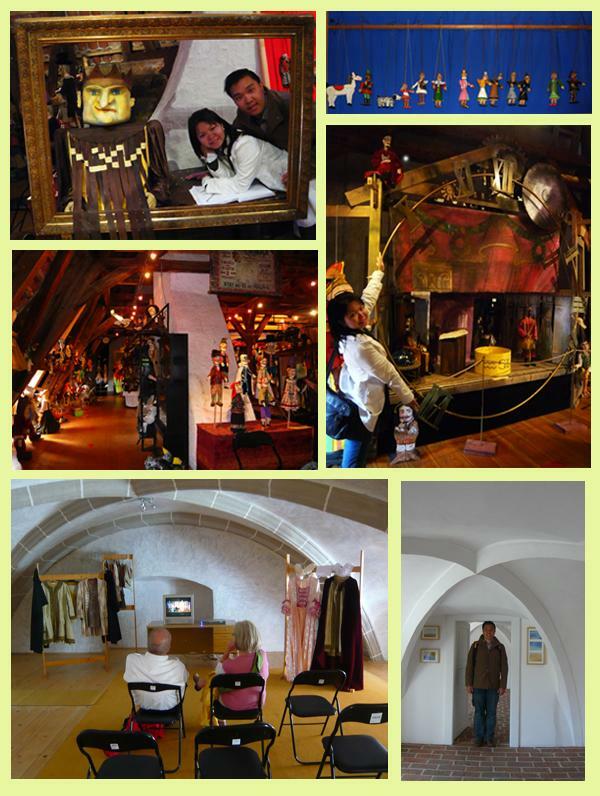 The admission ticket (100 Kc) includes a guided tour around the museum premise (which comprises just of 2 floors – the souvenir and puppet show watching area and a room full of different types of puppets). The guide explained to us the art and mechanics of puppetry before bringing us to the room where all the puppets are stored. This place looks quite eerie especially if you are here at night :-). There are puppets about anything! – animals, humans, monsters, birds and even houses and airplanes! There are various stages for puppet performances ranging from small ones (for home entertainment purposes – where grandfather would perform for their grandson – again back when there were no TV or internet) and larger scale ones for mass audiences. The tour ends with a video of an actual puppet show – in Czech language. wooo…some of the puppets looks scary. .-= kelvin´s last blog ..A fire just broke out in the HDB flat I staying. =-. Seems to me there were not many visitors to the museum? .-= a_x´s last blog ..Pie Kia (I swear I’m not vested in Old Chang Kee shares!!) =-. Hi Kelvin, yes some of the puppets do give me the creep. But its amazing to see that puppets can come in so many different forms. The only puppet that I knew previously was the one from Pinocchio. Hey these are good looking photos! Love the marionettes! We never had a chance to check out Thailand puppetry one of these days. Hopefully we’ll be able to watch them next year. Český Krumlov is amazing town. Do you heard about muzeum Vltavínů? It is museum in Český Krumlov. Visit – I was here and I can recommend.